The camp conducted by the Mata Amritanandamayi Math for the children affected by the tsunami in Alappad Panchayat concluded today at Amritapuri. The Honourable Minister of Education, Sri. E.T. Mohammed Basheer, gave away the certificates of participation to the 3,000 children. “History will be the witness to the love and compassion Amma has showered on the tsunami-affected people and the service Amma has rendered to them,” he said. The tsunami has created a big shock in the minds of the children in the affected areas. Understanding this, Amma has been providing them with counseling for the past several months through child psychiatrists of Amrita Institute of Medical Sciences. Many children have become afraid of the sea and of water in general. Among many programmes focused on the care of the children, the Ashram has been offering them swimming lessons in the Ashram swimming pool. Now for the development of their knowledge and enthusiasm, the Ashram has organised and begun offering free classes in spoken English, yoga and Sanskrit. Special emphasis is being given to the personality development of the children based on cultural awareness. Yoga Acharyas from the Patanjali Yoga Vidya Peetham, English teachers from the Amrita Educational Institutions and sannyasins from the Ashram are teaching the classes for the children. Today the children had a wonderful question-and-answer session with Amma. And every night of the camp, the children will perform cultural performances for each other. The food and accommodation is free for the 4,000 children, all of whom hailed from Kollam District, Kerala, that are participating in the weeklong camp. The tsunami has created a big shock in the minds of the children in the affected areas. Understanding this, the Amma has been providing them with counselling for the past several months through child psychiatrists of Amrita Institute of Medical Sciences. Vishukkani arranged at the Kalari, Amritapuri Ashram. 4.a.m, 14 April, 2005. Today is the birthday of Amritapuri.org. It’s hard to believe that when we began on April 14, 2000, we only received about 500 hits a day. This year, when the tsunami hit Amritapuri, 4.8 million people logged on to the site in one single day! Today Amritapuri.org is five years old. Is it too much to ask? An impossible dream? When Amma is the giver, there can be no limitations, nothing is impossible. We pray for your continued help and support. Amrita TV—an initiative of Amma’s devotees—hit the air today with an audiovisual extravaganza in Trivandrum that brought together some of the brightest stars in the Indian arts. Amrita TV is dedicated to promoting value-oriented, responsible and socially conscious programmes, without compromising on the tastes and preferences of audiences. As one can see from the station’s initial line-up, it will offer a wide-range of programmes—serials, tele-films, movies, performing arts, documentaries and discussion shows. It will also establish itself as a platform for unbiased news. The inauguration of this new audiovisual media was done with the lighting of the inaugural lamp by seven luminaries—representing the seven svaras in music and the seven colours—they were Padmashri Sonal Mansingh, odissi dancer of international repute; Padma Bhushan Bhupen Hazarika, well-known singer; Shri. Ramesh Sippy most renowned director-producer in India; Padmashri Mohan Lal and Padmashri Mammootty—the leading superstars of Malayalam cinema; French film-producer Monsieur Manuel De La Roche and Swami Amritaswarupananda Puri, Vice-Chairman of Mata Amritanandamayi Math. Before the inauguration Amma’s message of blessing was aired. “We alone are the ones responsible for many of these problems; we have created them. We can trace the origin of all problems to the human mind. This is where all problems start. Therefore, our primary dharma is to cultivate values in us. Media is one of the instruments to achieve this.” Amma reminded every one. The programme was conducted in M.I. College grounds in Trivandrum. The settings were appealing and the stage humungous, towering to a height of 43 feet. The grounds were filled to capacity as expectant people flocked in to take part in a programme, which they felt was the birth of a transforming influence on society. Amrita TV will also feature programmes that offer insight into the sacred texts and epics of India, bhajan programmes will also be broadcast. Currently all programmes are in Malayalam and is being broadcast via satellite to all of India, the Middle East, and the rest of Asia, Australia, Europe, and later on Canada and the United States. Amrita TV utilises INSAT 2E/APR-1 satellite for transmission having wide-beam footprint covering the whole of Asia from Japan to Gulf countries, Australia, Europe and North America. The channel uplinks from its own earth station, which is capable of transmitting four channels at a time. It also uses the MPEG/ IMX format for production/post-production, the latest technology in visual media providing excellent colour reproduction. Its new studios and newsroom facilities are fully automated with fibre-optic connectivity across India using “beehive digital news gathering technology,” the first channel to do so in South India. Amma finished giving darshan around 6:00 in the morning, thereby concluding Her first ever Brahmasthanam Festival in Trissur. On Her way back to Amritapuri, Amma made several stops at places She was invited to during the festival. In Trissur itself, Amma visited the Brahmasvam Matham, a math where Vedic chanting is taught to Brahmins. In Ollur, Amma got down to inaugurate a Vidya Rathanam ayurvedic museum. And in Chalakkudi, Amma lit the lamp at the foundation-stone-laying ceremony for a Narayana Guru Chaitanya Matham meditation centre. At all the stops, Amma gave darshan to the devotees there, including some 1,000 people at the Vidya Rathanam museum. Photo: The Swami of the Narayana Guru Chaitanya Peetham offering padapuja to Amma when she visited the peetham. My Amma is that love which transcends all these boundaries. Amma says the heart is the needle that sews the world together. Such is the thread of Amma’s love. It cares nothing for caste, creed, social status or politics… It simply comes like the monsoon—nothing can escape it. During the Trissur Brahmasthanam Festival, Amma was invited by two of Kerala’s communities to bless them on Her return to Amritapuri—the Nambootiri Brahmins of the Brahmasvam Math and the Ezhavas who come together under the Math of Sri Narayana Guru. In one way it was nothing new, but in another was the perfect illustration of the enormity of Amma’s embrace. Once they’ve fallen into Amma’s arms, who doesn’t feel Her to be the Mother? Amma has devotees in virtually every country in the world. People of all political parties sing her praise. Hindus, Buddhists, Jews, Christians, Muslims—all can be found at Her Ashram. Recently in Sri Lanka, soldiers of two warring armies came for Her darshan, peacefully side by side. “It is difficult for Amma to speak something to you who are at the place where speech ends,” Amma said that day to the Brahmins at the Brahmasvam Math. It is hard to say the exact meaning of Amma’s words. But clearly She was making a reference to the Vedic rks that are taught and chanted within the math’s walls—the beginning less-endless cosmic vibrations perceived and given voice by the Rishis millennia ago. The Vedas point to that which is beyond sound, that which is beyond space, beyond creation. They point to the center of existence, the place where the Master is ever established, the place where the flimsy differences that comprise this world fail to effect a ripple. This is what people of all castes, creeds, faiths, political parties and countries touch during their moments in Amma’s arms. And this is why all are able to come together as Her children. 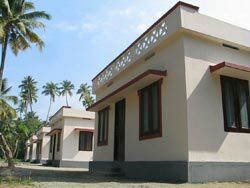 The first 18 tsunami-relief houses built by the Ashram were finished today. Complete with red-oxide cement floors, electricity, plumbing and painted walls, the houses stand 100-percent ready for inhabitation. The houses are located in Mayabazar in Edavanakkad of Ernakulam District. The Ashram has informed the District Collector of Ernakulam of the houses’ completion.